X DOT 25 Music - A Legacy! In 1988 I was working at Pacific Bell in San Francisco, where I was holding a middle management position working on development of infrastructure of what you know as Internet today! I was also active in a professional society in the Silicon Valley called SIP. Having been a graduate of UC Berkeley and Stanford University, I had many professional friends and colleagues who were also involved in community activities, helping the society as they were also building the basic blocks of the High Tech Revolution. In 1989 I was on the Board of Directors of SIP. In one of the SIP general meetings I met Paiman who was visiting from Sacramento. At that meeting Paiman was invited to one of my, then very popular, social parties. Upon arrival in the party Paiman noticed the special music of the party's environment being; Jean Michel Jarre, Tangerine Dream, Vangelis, Depeche Mode, Pink Floyd, Genesis, Peter Gabriel, Dead Can Dance, Gypsy Kings and even some classical music i.e. Adagio by Albinoni and Concierto De Aranjuez by Rodrigo! Few months later in early 1990, at a popular Concert in San Francisco at the Gift Center, we met again and I being involved in that concert's production, asked Paiman to manage a spotlight. After the concert, since Paiman was living in Sacramento and had to drive late, I asked him to stay in my house in San Mateo and do not drive so late. Paiman accepted. That night at 2:00 o'clock in the morning, when we arrived at the house Paiman told me: "I really liked your taste in music at your party few months ago, I like you to hear this tape of the music that I have created, performed and produced." I was shocked and could not believe such a thing but I agreed. Paiman ran to his car and came back with a cassette tape! I listened to it and it was impressive. Amazing melodies, full of emotions, and incredible orchestral arrangements! I was shocked how Paiman could have possibly done all of that by himself! He replied: "all with computers, sequencers and synthesizers - at home"! This led to a six hour conversation about music, and philosophies of life and in the morning X DOT 25 was born! Khosrow and Shirin is a story in Persian History. Shirin & Carsra Is story of a passionate love in Persian Methology. 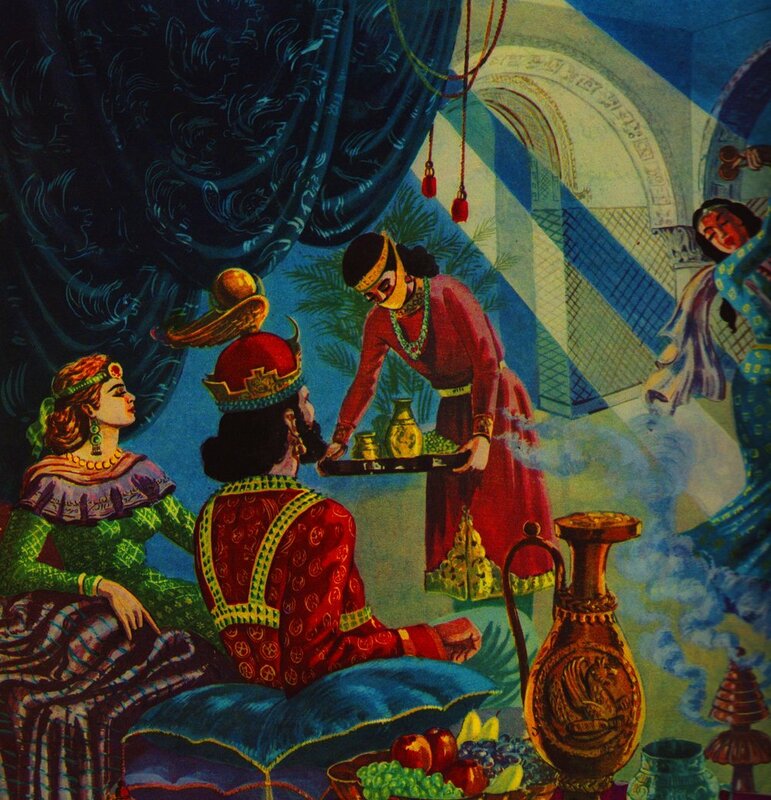 Here is a picture of Khosrow and Shirin from an old Persian History book. Coming from a large family of eight and being the youngest of all, at around five years old I was introduced to classical music. My oldest brother Manochehr, who was for many years my leader and mentor, had brought us a Groundig open reel player from one of his trips to Germany and with it he had purchased some classical reel tapes, specially Symphony # 5 and #9 by Beethoven and Symphony # 41 by Mozart! That was all I had to listen to on that machine! So my introduction to music was classical music. Later on, I listened to Rodrigo, Chopin, and others. In my early teen years I was introduced to Pink Floyd, Genesis, King Crimson and Moody Blues where I was getting a good dose of heavy music with deep lyrics and that is when I noticed there is correlation between music and philosophy of life, emotions and more.... I found music as soundtrack of my life! This transcended everything else in my life.specifically songs like: Epitaph by King Crimson, Melancholy Man & Nights in White Satin by Moody Blues, Welcome to Machine by Pink Floyd! When I was 8 years old in the summer, I made my first movie with music and all! Watching TV, I decided I make my own movie and have my own box to show it in. So I created a story line and cut pictures from books and magazines and pasted them together frame by frame. Them grabbed a cardboard box and cut the face of it and using 2 sticks that I had my "film" rolled around them, I installed the film in the box so the pictures could be seen from the cut out window. I also installed a small curtain in front of the opening with ropes to pull them to open and close. I also used a spot light to be able to see the pictures in the dark. Then I invited my friends into the dark basement of our home and had a show with classical music and recited the story for them. They even paid an admission fee to get in to see it! In early teen years, I listened to western classic rock bands along side classical music and suddenly my brother Abe brought home a tape that he had received from his friend with the music of Tangerine Dram and Klaus Schulze. I found that music totally amazing and along side these we found Vangelis and whole flue of electronic musicians including Jean Michel Jarre. When I started college in Connecticut, I was planning to become a mixing engineers and run large sound and light mixing boards in large concerts, Thus I choose Engineering as my major and by transferring to USC and later on to UC Berkeley, I continued with the mixing engineer concept but after graduating from Graduate school at Stanford ended up working in Telecommunications! Music was still running strong in every artery of my life. Thus in 1981 we bought a Prophet 5 Synthesizer made by a small company called Sequential Circuits from San Jose, California, and the whole world changed for me even further. X.25 was a telecommunication protocol. X.25 is one of the oldest packet-switched services available. Bell System of the time owning the local phone companies was the think tank of the telecommunication industry. Back then research was being done about connectivity of people with each other through the network with what turned out to be the Internet we all know today. Working in this environment, having the vision of the internet ahead and the lifetime love for music and film, I decided to call the music company X DOT 25 Productions. The idea was for us to be able to connect artists, music and film producers with people by having them send their art form in a "package" that was a CD or DVD. Similar to the packets of information in the technical X.25 communications cloud. Thus X DOT 25 name was born. Paiman and I had many discussions regarding X DOT 25 official colors. Our music had a darkness and bright colors were not a choice. Being in music business most everything you see, like equipments and clothes everyone wears share the color Black! So the base color became black. 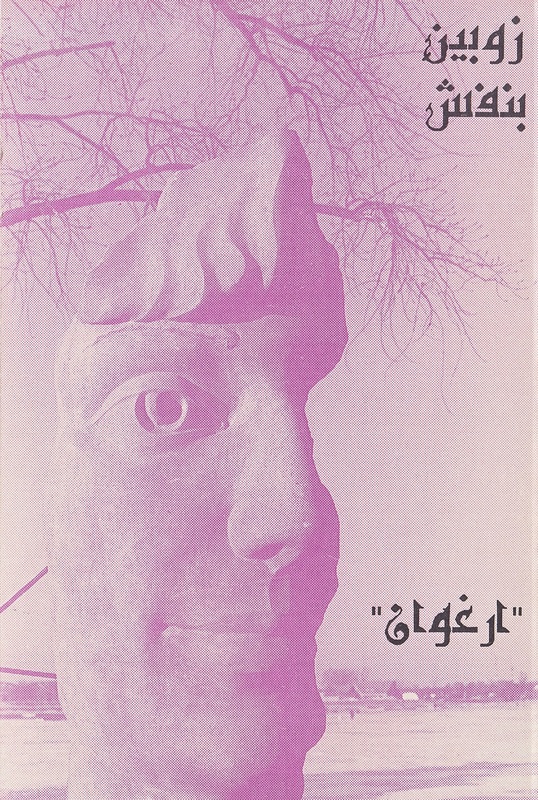 To add a contrast and yet still keep the darkness in the mix and the fact that Paiman liked Purple (Banafsh in Persian) individually, purple was the 2nd color and later the color white (chosen by Max) was added to bring in purity, love and softness to the mix. So the official colors ended up with Black background with Purple and White overlays. 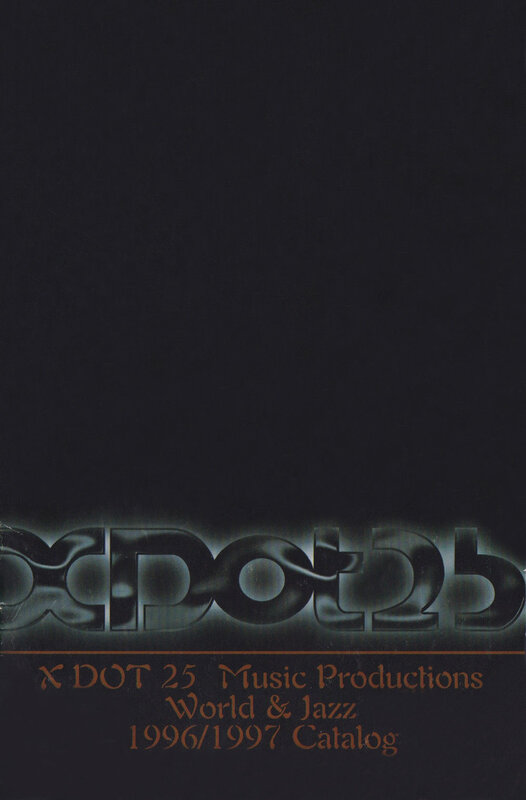 Flag of X DOT 25! That day we went back to the backyard of the house I owned in San Mateo California. 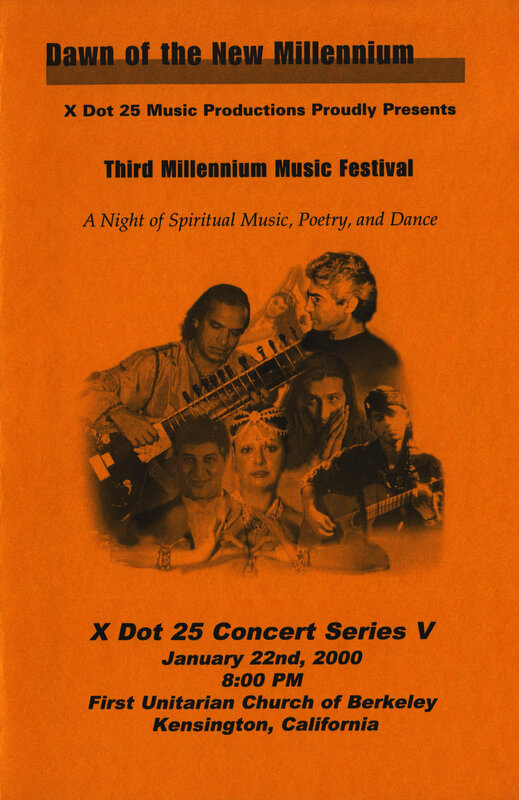 I had a black Sheet for a twin bed we used it to create the Flag of X DOT 25 and the tagline of "The Music Of Third MIllennium" was created and was written on the flag. We were a decade away from the year 2000, The Third Millennium and our music was set to push the envelope from the beginning. But Millennium was misspelled and we kept it as it was - misspelled! This flag was hung in the living room where all the studio equipment was located and lot of music with amazing melodies were created. And for years and still hangs in any office X DOT 25 has been running out of. The label was setup by now and naturally we needed some acts to be produced within it. So we created a band of 2 called Zoobeen Banafsh (Purple Arrow) and set out to created some great music. New logo designed by Saeed Saeedi for the release of Awakening by Ashavahishta. Koorosh Angali Recites Rumi 1997 - News Groups! 3/17/1997 X DOT 25 Radio Up and Running - Check it out! This page is continually updated as time permits. Additional information are added here chronologically. Please revisit.